But what happens when students are asked to solve 7 x 7, 8 x 9, or 12 x 6? Sure. They could use one of the strategies listed above, but that would take them a very long time to solve. This is when we start introducing students to more efficient strategies. Why is the Distributive Property of Multiplication important? 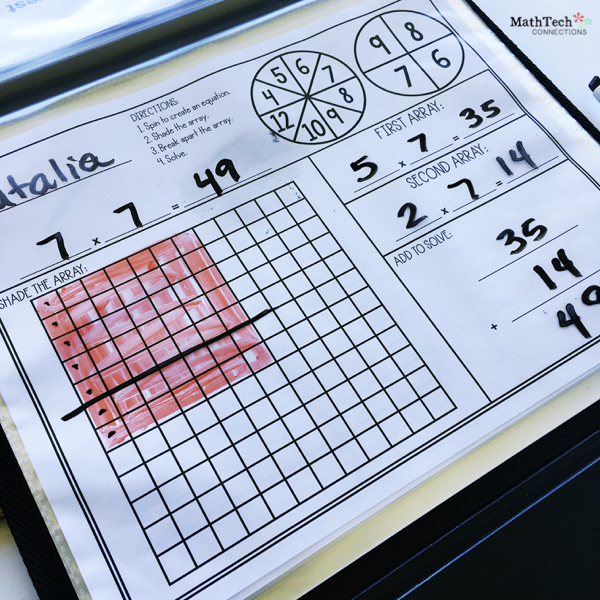 Multiplication can be challenging for students. Some students are overwhelmed by a problem like 7 x 7 = ?. Students can use the distributive property to break down a difficult equation into smaller, more manageable problems. That 7 x 7 = ? equation doesn’t seem so difficult when it’s seen as (5 x 7) and (2 x 7). It’s important for students to first see what the property looks like. They aren’t just coming up with random facts. It is still the same array. They simply break apart the array. Solve the simpler problems, and combine to find the answer. 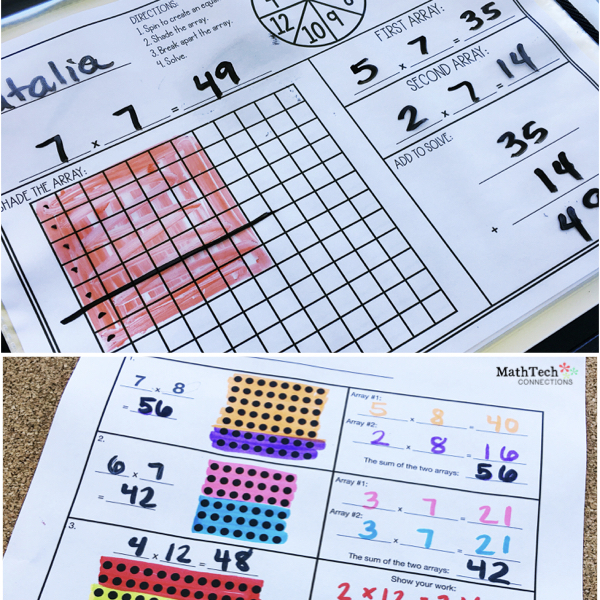 Place the worksheet pictured in a sheet protector and have students practice breaking apart math facts. 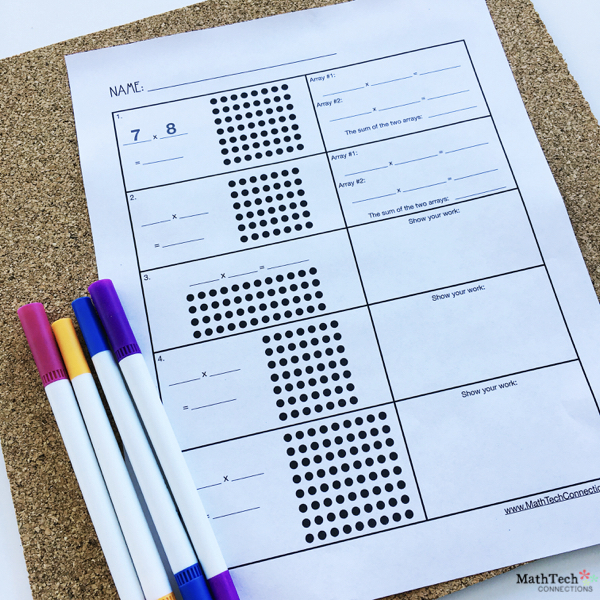 Here’s another activity you can use with your students. Again, it’s important for students to see that they are breaking apart the array into smaller, more manageable problems. I found it a great idea to use markers, crayons, or highlighters to show how students broke apart the array. See picture below. > Spin an Equation Dry Erase Activity! > Get automatically added to our newsletter! It’s important to give students several opportunities to practice the strategies you’ve taught. 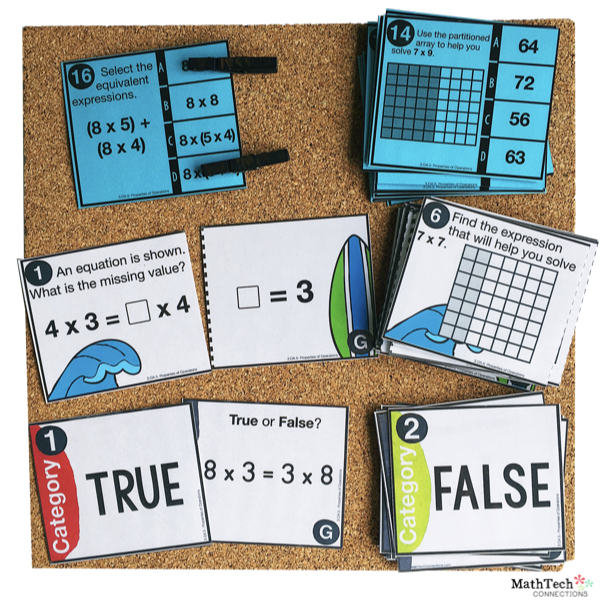 The following set includes 3 math games that review the properties of multiplication. Add these math games to your math centers for the week. 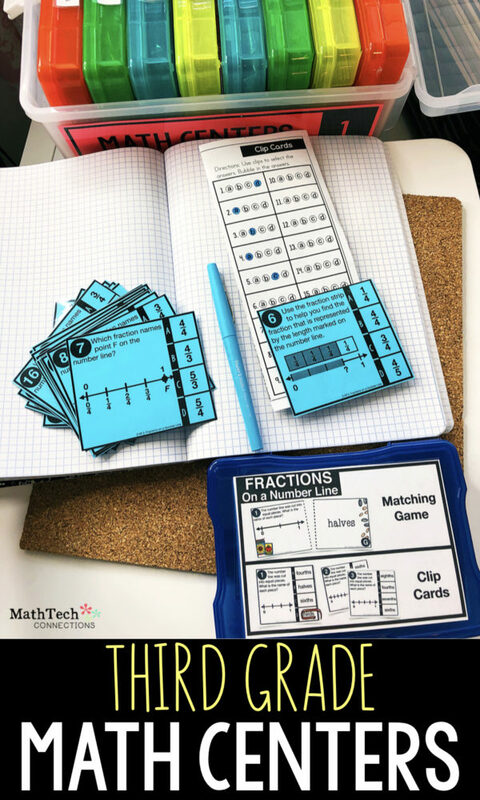 You will find that it’s easy for students to keep up with these math games, because students have to keep up with only one recording sheet! Click the image to view the resource. 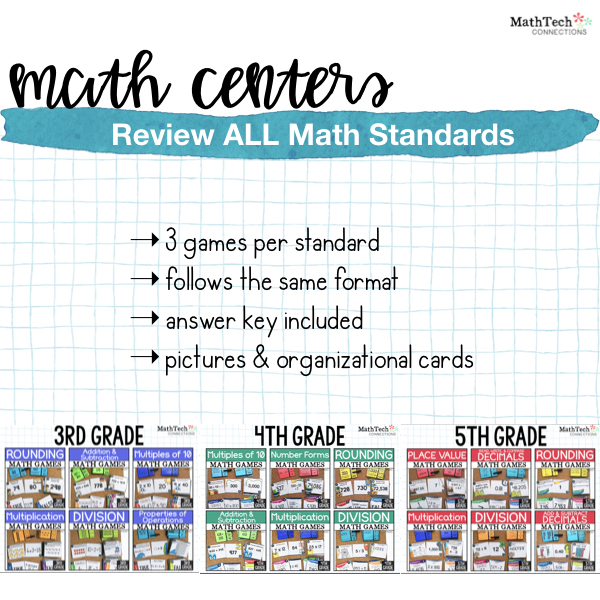 I currently have math centers available for third, fourth, and fifth grade. After students have practiced breaking apart arrays using pencil and paper, they should move on to digital practice. 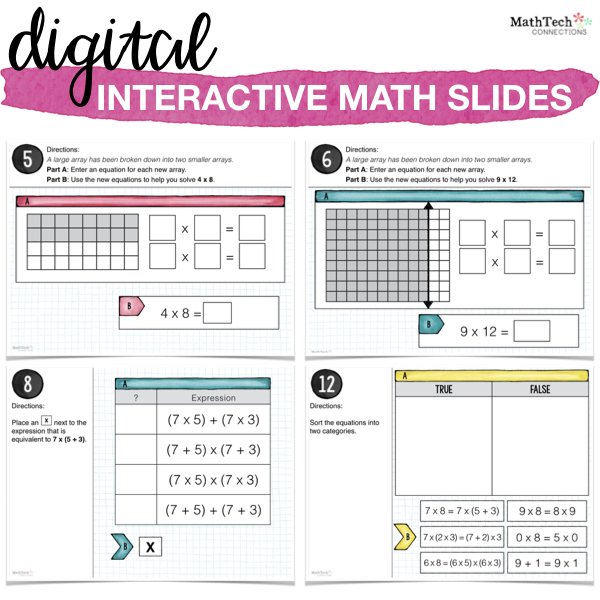 These digital slides are made specifically to review third, fourth, and fifth grade math standards. Students will review math standards AND computer skills such as.. The video below shows a quick overview of this resource. 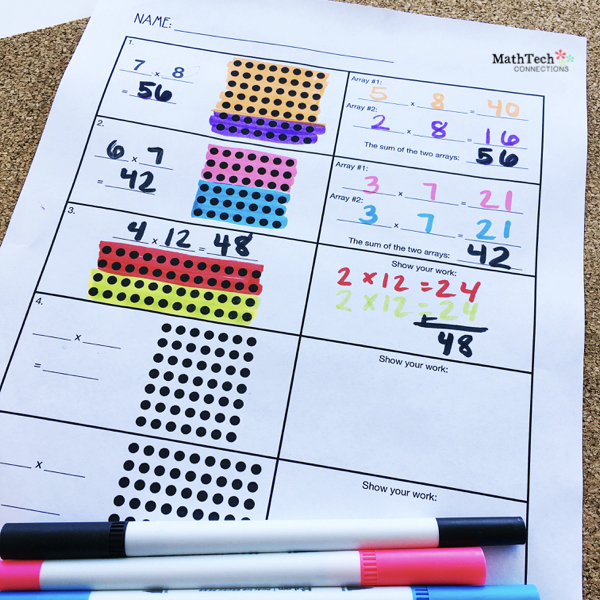 Join the newsletter and two free Distributive Property of Multiplication printables will be sent straight to your inbox!